For my first pumpkin-y recipe of the season, I decided to tweak a pumpkin granola that I've made in the past (and know I love) and layer it with some tangy plain yogurt and a sweet cranberry compote. The granola simply requires combining some oats, pepitas, and spices and coating them with a mixture of pumpkin puree, applesauce, maple syrup, brown sugar, and vanilla. It takes nearly an hour to dry and crisp the oat mixture in the oven, and then it's done. Once it's cool, it's ready to use as a crunchy parfait topping. For the compote, you simply simmer cranberries, sugar, water, and a little orange zest until the cranberries pop and become jammy. Same as the granola, the compote just needs to cool before it's ready to use in the parfaits. I spooned the compote into the bottoms of mini martini glasses, covered it with a thick layer of yogurt, and topped it all with the granola. I loved the splash of color the compote added and the crunch the granola contributed. The melding of pumpkin and cranberry makes these perfect for fall and conjures images of giant leaf piles and blazing red and orange tree lines. I know many of you out there are missing summer, but I think it's time to let go and embrace fall. Making these parfaits is just the way to do it. The parfaits are easy to throw together for a quick breakfast, they can be packed up for a work snack, or you could even make a bunch of them to serve at a fall brunch. Pumpkins. Cranberries. Crunchy leaves. Fall. It's time. Layers of sweet cranberry compote, tangy yogurt, and crunchy pumpkin-y granola combine to make colorful, flavorful fall parfaits, perfect for an elegant brunch or a simple breakfast or snack. Preheat oven to 325 degrees. Line large baking sheet with parchment paper. In large bowl, stir together oats, pepitas, cinnamon, salt, cloves, and ginger. In medium bowl, whisk together brown sugar, pumpkin puree, applesauce, maple syrup, and vanilla extract until smooth. Pour brown sugar mixture into oat mixture and stir with rubber spatula to coat oats evenly. Spread mixture onto prepared sheet. 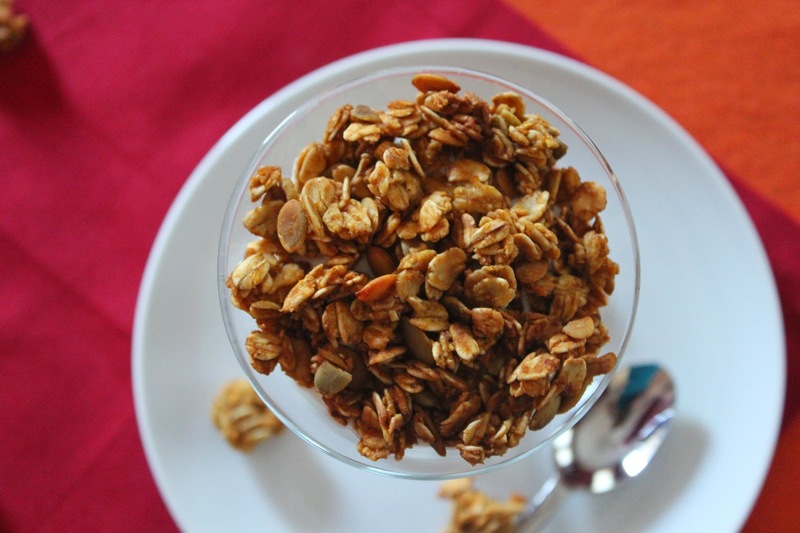 Bake for 45 to 55 minutes, until the granola is golden and crisp, stirring and turning 2 or 3 times during baking. Transfer sheet to wire rack and let granola cool completely. Bring to boil over medium heat, then reduce heat to simmer. Simmer until cranberries have popped and mixture thickens, about 12 minutes, stirring and smashing cranberries against sides of pan occasionally. Transfer compote to small bowl and let cool completely. Chill until ready to use. Spoon a little compote into the bottom of each serving dish (glass dishes will show off the layers), top with a layer of yogurt, then finish with a layer of granola. Serve. Note: I used mini martini glasses and used 1 teaspoon of compote and 3 tablespoons of yogurt for each glass and then filled the glasses the rest of the way with granola. You can really do anything you like with the layering. Has pumpkin been broken for you yet?